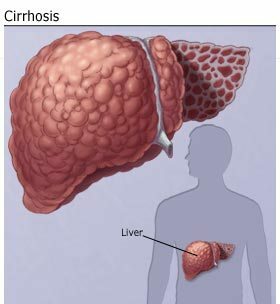 Cirrhosis is a complication of many liver diseases that is characterized by abnormal structure and function of the liver. -The liver is the largest organ in the body and one of the most essential.It produces substances that help fight infections and clot blood, filters toxins and infectious agents out of the blood, helps in the absorption of certain nutrients from foods, and stores energy for later use. 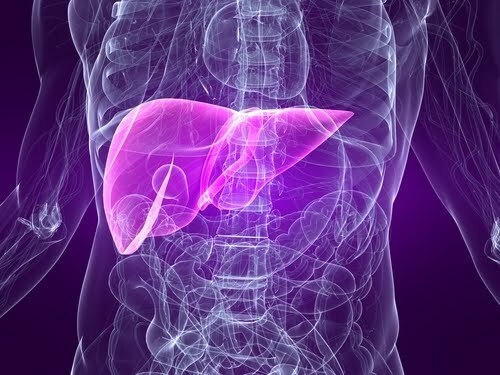 -The liver may be injured by a single event, as in acute hepatitis; by regular injury over months or years, as in biliary tract blockage or chronic hepatitis; or by continuous injury, as in daily alcohol abuse. -The liver responds to cell damage by producing strands of scar tissue that surround nodules of healing cells, making the liver knobby. -At first, the inflammation in the liver causes it to swell. As the disease progresses and the amount of scar tissue in the liver increases, the liver will actually shrink. -The scar tissue presses on the many blood vessels in the liver. This interrupts flow of blood to liver cells, which then die. -Loss of liver cells hinders the liver`s ability to perform its normal functions. -Loss of liver function affects the body in many ways. Cirrhosis, if severe enough, can cause many different complications. Spider naevi, which is dilated capillaries on the upper chest, arms and forearms. Sudden, involuntary, violent twitching of the hand when it is held outstretched. Homeopathy helps to control further cellular damage. It cannot cure the scarred tissues, as it is not possible to regenerate scarred tissues. When introduced at an early stage of cirrhosis, homeopathic medicines can effectively reduce the viral count as well as give symptomatic relief without side effects. Homeopathic medications can prevent the progress of cirrhosis and in very early cases of liver cirrhosis, the medicines restore the normal functions of the liver.